As many readers may know, myself and a team of dedicated, innovative, collaborative and fun-loving educators put on the very first edcamp unconference here in Philadelphia. We have been working tirelessly since November when we attended our first ever Barcamp to put together an education-focused professional development experience unlike any other. In my humble opinion, we succeeded. Succeeded beyond all of our expectations. 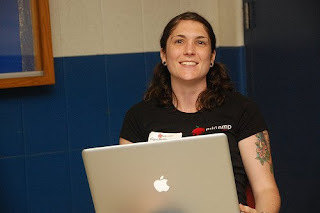 So what made edcamp so successful? 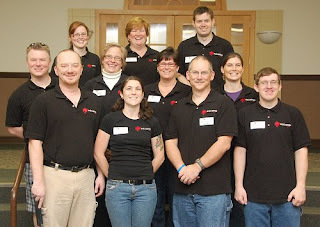 We had a team of organizers that most people only dream of. We had a diverse group of attendees, many of whom did not know each other or us personally. The attendees were brave enough and inspired enough by the 'vibe' to sign up on the spot to run a session. The attendees were not shy to having informal, open discussions that sometimes veered off topic. We stayed true to the barcamp model, letting the attendees essentially run the conference. The most amazing take-aways for me are that, while I moved around from room to room, trying to peek in on as many sessions as possible, I found it hard to get up and leave because I wanted to stick around to hear the rest of the conversation. At one point, that little voice in the back of my head said, "Wow. I helped PLAN this!" It was something that I would want to attend! Another unique and exciting aspect of running an edcamp is that nearly all of the work happens before the sessions start, and then it's smooth sailing. I'm convinced that part of that ease was due to our amazing team, but the more I think about it, the more I think it is a product of the model itself. Since the presenters are all attendees and no one is getting paid and no one paid to be there, it takes the pressure off of everyone and allows everyone to enjoy themselves. In addition, once the schedule is set and everyone understands how it works, it basically runs itself. Session leaders tweeted out invitations to their own sessions. Attendees tweeted out interesting sessions for others to find. If anyone needed something, often an attendee was able to offer help (like a laptop dongle for lil' old me!). Our job as organizers that day was simple: be welcoming, be friendly, be helpful and participate! Of course, there was the whole get up at 4:45am and get to Drexel to set up thing plus almost 6 months of non-stop planning, but the day itself was fun AND enjoyable! The final most AMAZING thing is how quickly people have pulled together to run their own edcamps! Within 24 hours we had educators from up and down the East Coast and the Midwest discussing hosting their own unconferences! Thank you SO much to the attendees. You made the conference. We merely provided the venue, tee shirts and coffee! We also had some generous and helpful sponsors to boot. I can't wait for the next one. Hint, hint: bring a friend! To my fellow organizers: I now consider each and every one of you a close friend and I am so blessed to have met all of you. This experience has been invigorating and life-changing! We did it!